Amazing – Grassroot Actions Rock !! January was Stop Killing Cyclists’ second full month in existence. Just look at the amazing list of actions you guys have helped deliver in just one month!! Whew – its been a whirlwind, rewarding and exciting month for cycling/pedestrian safety. With NO money and with NO professional organisation!! 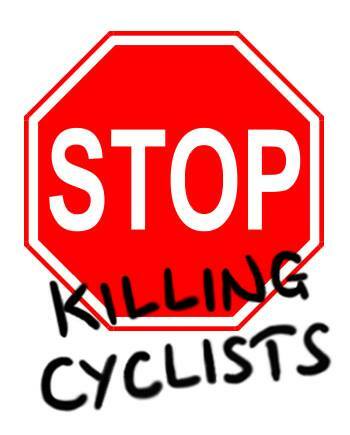 Whilst there is lots lots more to do over the coming months as we work towards our goal of safer streets for all – and the more members of Stop Killing Cyclists pitch in, the more we can achieve, I think we all ought to take a bow today!! Thank you everyone who has helped so far. 1. Launched successful Subvertisement Internet Blitz Campaign which went round the world – where members creatively virtually graffitti’d Transport for London posters with safety campaign slogans. Inspired by Tom Kearney and Castel Burke. 2. Had top-level meeting with Transport for London’s Managing Director Leon Daniels and the London Mayor’s Cycling Commissioner Andrew Gilligan to discuss Stop Killing Cyclists Demands. Attended by Steve Routley, Betty Sabha, Will Nickell, Donnachadh McCarthy and Tom Kearney. Briefing paper by David Hicks. 3. Successfully got Department of Transport to re-issue Ministerial Guidance on responsible pavement cycling. 4. Successfully persuaded Association of Chief Police Officers to issue the renewed Ministerial Guidance on pavement cycling to all local police forces. 5. Made formal submission to TfL consultation on dreadful proposals for Tower Bridge Road junction. 6. Will Nickell launched a massive research FOI project into the performance of all the 32 London Borough’s which are responsible for 95% of London’s roads. 7. Made formal submission to London Council’s consultation on lorry safety equipment for cyclists – urging them to require full complement of safety equipment. Initiated by David Robjant and Fred Smith. 8. Held members meeting to discuss Stop The Killing Coalition and agreed national event in November to highlight Traffic Violence. 9. Agreed formal letter requesting Times to change terrible misleading headline about a non-existent “army of walking wounded” created by cycling when in fact there is such a tragic army created by motorists. Many individual members likewise submitted objections. 10. Wrote to ASA objecting to decision to censor Cycling Scotland’s cycling safety advert which sought to ban all portrayals of people cycling in correct lane position or without helmets. 11. Successfully requested meeting with senior officers at Metropolitan Police for meeting to discuss policing of cycling in London. 12. One of our major demands which the Mayor’s Office two months ago in response to our TfL Die-In demonstration was “wacky” and said was impossible is now to be half-implemented – ban on blindly-driven trucks in London without certain safety equipment is now to be introduced. 13. Member Fred Smith submitted a response to Westminster Council’s cycling consultation. 14. Organised Deputation to call for urgent improvement in Southwark Council’s woeful record on cycling investment/safety to Southwark Council’s Full Assembly. Deputation included Jane Dent, Freddy Escobar, John Garthwaite Donnachadh McCarthy, Abby Taubin. 15. Steve Routley is preparing designs for launch of the Stop The Killing National Event in November for a Facebook launch next week. 16. A number of the above events got considerable media coverage in the local, national and specialist press. 17. We broke through our 1,700 member milestone today!! 18. Successfully persuaded TfL to include provision for cycling in Crossrail study of potential pedestrianisation of Oxford Street. 19. Got agreement of Cycling Commissioner to request Mayor to appoint cycling/pedestrian reps to TfL Board. 20. Sent out invites to 8th February Stop Killing Cyclists “Cycle Planning Disasters Tour”. 21. Steve Routley designed our great new logo. 22. Andrew Reeves-Hall ran our really useful Website (this one 🙂 )and press-release uploads. 23. Etc etc etc – apologies for volunteer names and actions I may have left out – let me know if I have !! But most importantly thanks to all the un-named volunteers and supporters and Stop Killing Cyclists members without whose help none of the above could have happened.! !